Just before I started writing this review, I started to think, what if I’m not really suited to write a Symphony X review. Why, you might ask? Well, the thing is, I’m not really a fan of the band. That said, I’m not a no-fan by any means, quite the contrary, I really like the little I have heard from them. Within there lies the problem, see, I really don’t know much of and about this band at all. Symphony X has released nine albums since their self titled debut back in 1994 and the first record I heard by this band was the amazing Paradise Lost (2007). I haven’t heard one single note from any of the earlier records. I know I should have because I really love Paradise Lost and the same goes for the follow-up Iconoclast (2011, reviewed here). Why, when I really, really dig these two albums, haven’t I dug into their past then? I really don’t know, I just haven’t got around to do it, I guess. Sounds kinda nonchalant, doesn’t it? I don’t even know who’s in the band, except for singer Russell Allen and guitarist Michael Romeo. Still, since I first got around to listen to Paradise Lost when it came out, I have really looked forward to whenever a new release is on its way, so I guess there really is a Symphony X fan in me. For you who is reading this, feel free to drop me a line and recommend some early Symphony X records and which to start with and I’m sure I will get around to giving their earlier stuff a go in the near future. But for now, Symphony X has released a new record and that one will be my priority for now. So with the two predecessors being really damn great in mind, there is some really big expectations on this one. That means that if Symphony X has recorded an album that is just “good”, they have failed because this record will be compared to two records that are great, that is how high we set the batten for this band. Intros usually do not rock my world that much, but the intro on this album – called “Overture” – really does. It has an evil kind of sound with some Latin chanting which for some reason make it sound even more evil. This is what I call a good start. “Overture” goes straight into the first single “Nevermore”, a typical Symphony X rocker, a bit progressive and at times it sounds like a more metal Yngwie Malmsteen. Also, Russell Allen’s voice sounds a bit different from what I’m used to – more melodic and smooth and not as angry and hard. It actually suits both him and the song well. The title track follows and it takes me back to the days of Paradise Lost – heavy, dark and aggressive, yet still very melodic. A killer track and a future live favourite. That’s my guess, anyway. “Without You” is a ballad with a big pop twist. Very melodic, but they still manage to keep some heaviness to it – I love it! “Kiss Of Fire” is a killer track that sound as if it was written for Iconoclast but never made it to the album. It’s heavy, fast, aggressive and in-your-face – awesome! “Charon” is melodic Metal at its best. It has the darker twist that were Paradise Lost‘s signum. “To Hell And Back” has a title that the first guess would be that it’s an über-heavy Metal track. In some ways, that’s correct – the song is dark, heavy and aggressive, but the overall melody is Pop. I really love the mix, what a killer song! “In My Darkest Hour” is a fast Metal track, a bit furious but still accessible with a very catchy melody both in the verses and chorus. “Run With The Devil” is a more straight forward, 70’s Rock influenced track, but still with the Symphony X sound on it. Again, Allen’s voice is set in a softer – if you can call it soft – mode and again it sounds great. “Swan Song” is superb. An epic ballad, heavy and full of darkness, but still both beautiful, melodic and powerful – one of this album’s biggest moments for sure. “Legend” is the song that give us a wave goodbye for now and man, how it does the job. It’s a rough Metal track with clear 70’s influences, but also with more hooks than a fisherman’s hat. Michael Pinnella’s keyboard solo brings Tony Carey on Rainbow Rising (1976) to mind and is a total killer. I needed just one spin to hear that Symphony X has made one helluva record and in my book, it beats its two (killer) predecessors. If this is Symphony X’s best album to date, I can’t say because as I said, I haven’t heard the rest of them. That, however, must – and will – change in the near future. This band really know how to mix their often heavy, dark, aggressive and progressive Metal with catchy melodies, Pop hooks and memorable choruses and it sounds as if it’ is the most natural thing in the world. And yes, they know how to write a damn good song as well as being marvellous musicians. 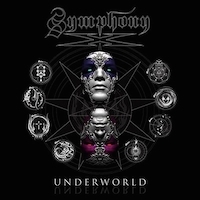 If any of their earlier records are even close to the brilliance of this one – and the last two records – it’s both a mystery and a shame that Symphony X aren’t one of the giants of Metal because then they damn well deserve to be. So, for all the Metalheads out there that hasn’t heard of this lot, get this album, it’s worth every penny!